Sea turtle research is unique in that many if not most of the people actually out in the field taking data are volunteers. By day, they are teachers, librarians, business owners, lifeguards, firefighters, students, retirees, you name it. If you’re curious, check out the network’s website. 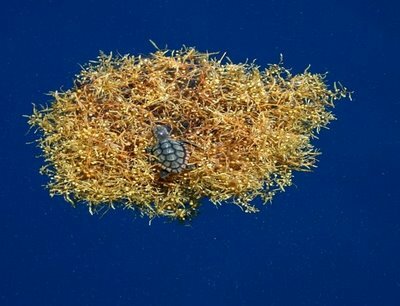 Sea turtles are the classic cute endangered animals that can really make someone care about marine conservation. And all of this data has gone to help produce population assessments such as this that confirm that while overall population is declining, some areas are actually increasing. But no where is back to the populations on which people could walk out to sea on the backs of turtles. Well, that’s the legend many of the volunteers cite. I doubt they think it’s true, but the idea that turtles were once so abundant they were constantly around has stuck in the minds of the volunteers and likely many others. They’re referring to the Caribbean turtles, where nesting beaches can still be found lined with nesting mothers. Other legends include the American Samoan story that turtles will protect fishers and bring them ashore in the case of a downed ship. Pirates of the Caribbean played off of this story in a joking manner saying that Jack Sparrow had survived stranding on a desert island by rescue from a sea turtle. It’s an Ocean of Pseudoscience Week! Sea turtles are also the only reptiles people really get fired up about protecting and researching, which might make finding volunteers to help easier. There are tons of herps that need protecting, like just about every South American amphibian needs protecting from chytrid fungus, but no one really gets starry-eyed about it.